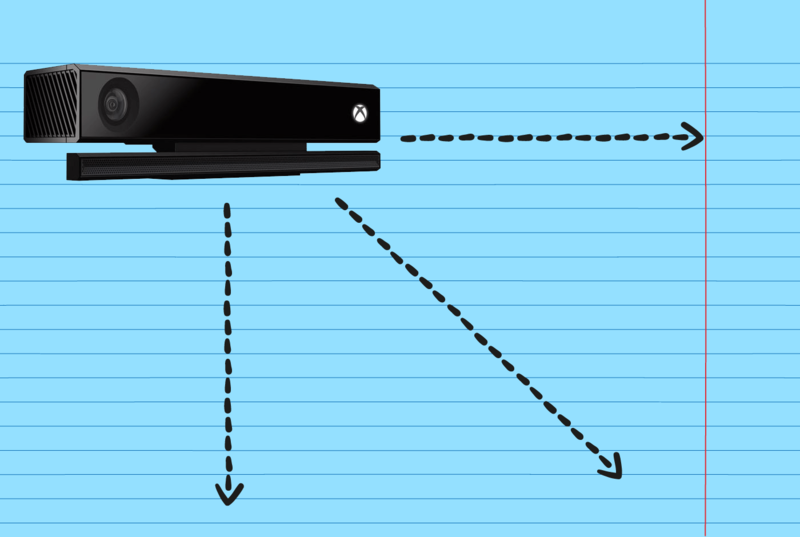 Today, I’m going to share a little trick that will save you a ton of time when working with Kinect: how to properly measure the distance between the sensor and a body or object. Surprisingly, I was asked the exact same question by three of my blog readers during the past 10 days! If you liked this post, then you’ll love Vitruvius. Vitruvius is the result of my Kinect research during the past 4 years. Vitruvius will help you minimize the development time and create tough applications with just a few lines of code! Includes advanced Mathematics, Avateering, Video Recording, Face Tracking, and more. Also if one can work with distance2 (distance squared), say if they just want to compare distances, instead of distance itself, they can avoid the cost of the square root calculation. Dear Author, will you please provide me a tutorial for calculating the distance between two joints (out of 25) when a person is standing still? Hello Eric. If you’ve already detected an object in the 3D space using the depth frame array, you already know its distance from the sensor: it’s the ushort value of the depth array (measured in millimeters). Hi sir, i am using kinect xbox 360 sensor with projector side by side, i want to calculate the projected screen dimensions. Can you please help me to find out. Hello. I’m not sure I understand what you mean. The screen dimension of Kinect for XBOX 360 is 640×480. I am working with Kinect to track the face. I need to find the distance between face and Kinect sensor but I don’t know how can I do that. I use lots of different command, but always I have some errors and some context that not exist on my code. I tried also this method that is mentioned above, but it doesn’t work also. Also I am using C# and I am a beginner in C#. Honestly if I find the Depth, it will be enough for me. but I tried it before and it didn’t work. because it doesn’t know body and it is just face tracker. Hi Ali. Are you using Kinect version 1 or 2? The code in this post targets Kinect version 2. Kinect version 2 always needs a tracked body to display facial information. I assume you have the X/Y/Z coordinates of a face point. In that occasion, the Z value is the distance between the face point and the sensor. But the problem is, how can I take the Z value(with which command)? also my code doesn’t know Z? Every face point is a set of X, Y, and Z coordinates. It should be yourPoint.Z or yourPoint.Position.Z. Unfortunately my codes doesn’t know the Z as a coordinate. int depthInMillimeters = depthImagePoint.Depth; // TADA! Great tutorial,is the distance returned in meters.is there a way i can also detect the height of my hand.Does this code also work for SDK 1.8(xbox 360). Hi Kaushik. Yes, this works for Kinect 1.8, too. The distances are measured in meters. Thanks for ur response.i hope the same concept is used,if I want to measure the distance between my hand and the sensor. I’m using matlab fro kinect (and some experiences of using C++) . Hi Ali. You’ll need a separate computer to run the second Kinect. You cannot connect 2 Kinect sensors to the same computer. Hello Vangos, Is there a way to measure the distance between the shoulder and arm of the human? Hi, I am trying to calculate the velocity of a person in front of the kinect using the right ankle. I’ve been doing this for a while but its just showing a wrong velocity value. This is my code. Please help me check where i’m going wrong. do i need to involve a frame no in my calculation or is the distnace not in metres. please someone should help me out. Hello. You would better use the frame count to determine the velocity, instead of using the actual time in seconds. The frame rate is not fixed — it’s between 15 and 30 frames per second. okay thanks. I used the frame rate but I’m still not getting it right. Could you please provide an example of the output values compared to the expected values? The output value of the velocity keeps on increasing even when the person detected is not moving. You’ll need to reset the timer and measurements. Velocity is increasing because the Dx value is increasing. You need to determine when to stop the measurements. please help me i am new to programming. Hello Ahmed. You can check my Kinect gestures tutorial. Hope this helps you. I am using sdk 2.0 and visual studio 2017 , when i am trying to run our code its showing so many errors , actually my only aim to understand kinect detects hand gesture or not ? before i used FSM 400 sensor for hand gesture now i am using for same testing purpose , but i am unable to detect different hand gestures. You need to install the Kinect SDK version 2 and connect a Kinect sensor version 2. Hello. What unit of measure of length of points sdk v1? Hello. It’s measured in meters. is it possible to feed previously recorded depth images to the body detection algorithm for research purposes? Hello Ahmed. You cannot feed raw depth data to the Kinect SDK. However, you could use Vitruvius or Kinect Studio to read previously recorded data. Is there any way to process the data coming from 2 different Kinect v2 sensors connected to one computer? I want to increase the field of view by using 2 different sensors to track the same body. Hi Giorgi. The drivers do not allow you to have 2 Kinect sensors connected on the same computer. The drivers will only recognize one of them. To use many sensors, you’ll need many computers that communicate using sockets.